We drink a lot of La Croix sparkling water, which comes in typical soda-sized cans. We buy La Croix by the case from Costco, and we’ve been known to have several cases of the beverage on top of each other in our three season porch. While that’s straightforward from a storage perspective, it led to a tendency to leave the packing material around. 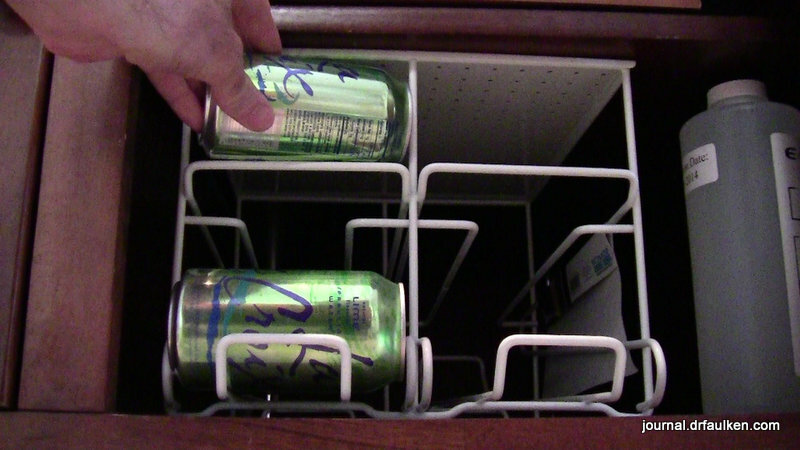 I wanted to keep our stash of La Croix, but also make some of it more accessible for guests. I bought a 24-can beverage rack made by Schulte, and despite finicky loading I am pretty pleased with it. Unlike other can racks I’ve purchased in the past, the Schulte is pretty heavy duty. The dispenser is made out of a metal tubing that is more than enough to handle two dozen cans. The 24-can rack seems like it’s two 12-can dispensers put together with some welds and a metal shelf on the top. It’s sturdy. My only complaint is you have to hold the can completely horizontal before letting go. If you don’t the can may get stuck in the rack. All in all, I like the Schulte 24 can dispenser rack. I have learned how to load it, and it’s built better than other lower-cost racks. That being said, I’d buy another one if it was under $20. There seems to be a big price gap between super cheap racks that wobble when loaded to more sturdy ones like the Schulte.